The Essential West. Elliott West. University of Oklahoma Press. Norman OK. 2012. 328 pp. 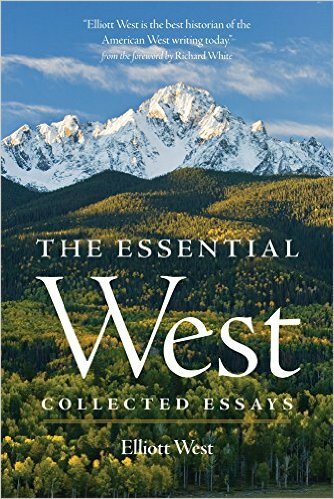 In this collection of 14 essays, penned across his career as a western historian, Elliott West (one of those remarkably synchronous names) takes on topics as diverse as epidemics and Lonesome Dove. Divided into three sections—Conquest, Families and Myth—the book takes a tour around the real and mythic geography of this region of the US, starting with the Lewis and Clark Expedition and ending with stories we continue to tell about the area, no matter their accuracy or not. Of course a central question any reader might ask is how West defines the West, on the ground and/or in the mind. Geographically West takes his delineation as the 98th meridian, originally posited by Walter Prescott Webb in the early 1930s, the far eastern edge of the Great Plains, the de facto starting line for the western frontier migrations after the Civil War. Wallace Stegner (following John Wesley Powell) later moved the line to the 100th meridian about 100 miles west, where rainfall dropped below 20 inches per year. As the author points out, the West of the Imagination is another place entirely. There are a multitude of interesting facts and asides throughout this book. The one most startling to me is the observation that really the US was settled from west to east, not our standard approach of east to west. Changing perspective is, I think, one of his major insight into historic re-interpretation.